Throughout the 64,000-square mile Chesapeake Bay watershed, urban runoff is the largest source of nitrogen pollution that has increased since 2009. When land is paved over, rainfall no longer soaks into the ground. It “runs off,” picking up harmful toxic, nutrient and trash pollution along the way and eroding local creeks and rivers by acting like a firehose on streambanks when discharged at high velocity. Washington DC is a leader in the Chesapeake region and nationally when it comes to stemming the tide on urban stormwater pollution through a combination of regulatory, market- and incentive-based programs. The District passed regulations in 2013 requiring all new and redevelopment disturbing at least 5,000 square feet of land to capture 1.2 inches of precipitation falling within its footprint. All renovations, building alterations and additions disturbing at least 5,000 square feet and costing at least 50% of the pre-project value must capture 0.8 inches of rainfall. A new development with 5,000 square feet of impervious surface would have to retain almost 3,600 gallons of stormwater – a little more than what a 12’ above-ground pool holds. The same size renovation would have to capture almost 2,400 gallons. These regulations mean new and redevelopment retain all rainfall from 90% of today’s storms and renovations retain all rainfall from 80% of storms. The District is also leading efforts to manage runoff from existing paved surfaces already harming local waters. First, the District created a Stormwater Retention Credit (SRC) Trading Program that leverages private capital to pay for stormwater management, an important innovation because a pound of pollution generated by urban runoff is more expensive to reduce than pollution from wastewater or agriculture. Remember all those gallons new or redevelopment must capture? Developers can achieve up to half the retention offsite by paying an in-lieu fee, managing stormwater beyond required levels on other properties they own, or purchasing SRCs generated by voluntary projects. The in-lieu fee is based on what it would cost the District Government to retain stormwater, and the current fee is $3.61/gallon. The going rate for SRCs generated by stormwater management projects in 2016 averaged $1.85/gallon, an almost 50% cost savings, and 2017 sales are trending higher. According to the District Department of Energy and Environment (DOEE), generally 10-15% of developers are pursuing offsite retention. Department of Energy & Environment Director Tommy Wells presents a certificate for Stormwater Retention Credits to the Anacostia Waterfront Trust for its green infrastructure project. The ability to meet the retention standard offsite doesn’t just save developers money; it also yields important environmental benefits because the impact of urban runoff varies drastically across the city. Much new and redevelopment occurs downtown where runoff flows into a combined sewer system. DC Water, a local utility, is building enormous tunnels to capture stormwater and sewage, store it until the storm ends, and send it to Blue Plains Advanced Wastewater Treatment Plant for treatment before discharging into the Potomac River. These tunnels will eliminate 98% of combined sewage overflows into the Anacostia River. In contrast, large swathes of the city are served by a municipal separate storm sewer system (MS4) that captures and discharges untreated stormwater into the District’s rivers and creeks. Bottom line: a downtown developer building in an area where all runoff will be treated can instead prevent stormwater in another part of the city from flowing untreated into local creeks and rivers. This green infrastructure will also beautify properties and provide valuable shading and cooling, which is increasingly important as climate change exacerbates already dangerous urban heat islands. The Anacostia Waterfront Trust and The Nature Conservancy are creating SRCs in the parts of the city with the greatest environmental benefit for the Anacostia River. On May 11, the Anacostia Waterfront Trust cut the ribbon on a RainPay rain garden and earned the District’s first SRCs for a purely voluntary project sited within the Anacostia MS4 drainage area. The milestone was the result of partnerships with the Progressive National Baptist Convention (PNBC), DOEE, Casey Trees, Anacostia Riverkeeper, and Greening Urban and funded with support from the U.S. Environmental Protection Agency and Altria through the Chesapeake Stewardship Fund managed by the National Fish and Wildlife Foundation. RainPay offers multiple benefits to participating landowners. PNBC incurred no costs, instead earning lease payments from the Trust for hosting the garden at its headquarters and utility discounts through RiverSmart Rewards, described below. The Trust uses revenue from SRC sales to cover project costs, including leases and ongoing maintenance, and reinvest in additional RainPay sites that will further restore the Anacostia and its tributaries. The Trust is pursuing agreements with other houses of worship, affordable housing developments and nonprofits for more RainPay gardens, creating a valuable revenue stream for these organizations. Across the river but still in the Anacostia watershed and MS4 drainage area, The Nature Conservancy and Encourage Capital are working with the Catholic Archdiocese of Washington to install green infrastructure at Mount Olivet Cemetery and generate SRCs. Their joint venture, District Stormwater, LLC, made headlines in 2016 when it announced it had received a $1.7 million private equity investment from Prudential Insurance Company to participate in DC’s nascent SRC market. The District has also aggressively pursued RiverSmart and grant programs to incentivize voluntary green infrastructure projects that manage existing urban runoff. Through RiverSmart Homes, homeowners can receive a free stormwater audit to determine if they are eligible to received subsidized practices to reduce urban runoff from their property. Since 2009, RiverSmart Homes has treated 145 acres by subsidizing 1,080 Bay-scaped yards, 787 rain gardens, 4,541 rain barrels, 5,188 trees and the replacement of paved areas with pervious pavers on 194 properties. DOEE also offers RiverSmart rebates for permeable pavers, rain barrels, cisterns, green roofs and tree plantings. Through RiverSmart Schools, DOEE provides funding and training to five schools annually to create green schoolyards that become outdoor learning tools. RiverSmart Communities is working with nonprofits and houses of worship to reduce stormwater pollution from their properties, lower stormwater fees, and engage community members. Through RiverSmart Rewards, properties that install runoff-reducing green infrastructure can receive discounts of up to 55% off DOEE’s Stormwater Fee and up to 4% off DC Water’s Clean Rivers Impervious Area Charge. Finally, DOEE’s Community Stormwater Solutions Grants provide start-up funds of up to $20,000 for community-oriented projects that improve water quality and raise awareness about runoff. Since 2016, the program has awarded 20 grants totaling $365,312. Dance Place’s 8th Street Arts Park Native Plant Garden, funded by DOEE's Community Stormwater Solutions program. Image source: Dance Place. 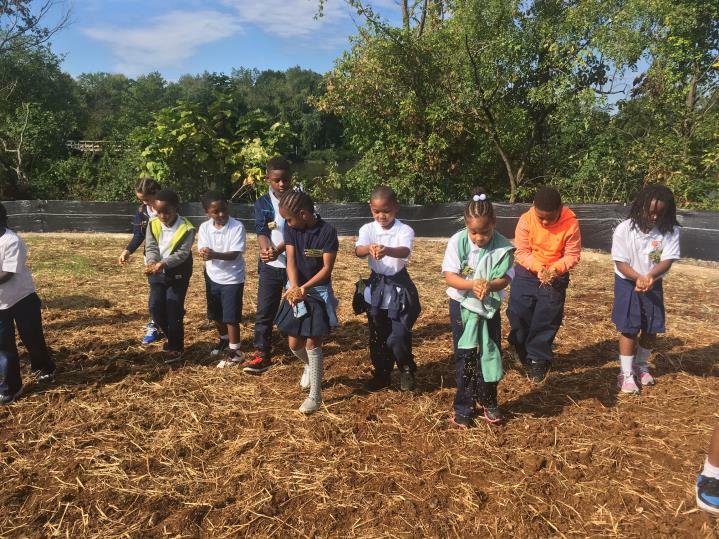 Kids participate in Anacostia Watershed Society’s Saving our Native Grasslands program, funded by DOEE's Community Stormwater Solutions program. Image source: Anacostia Watershed Society. Speaking at the RainPay ribbon cutting, Progressive National Baptist Convention General Secretary Dr. Timothy Boddie stated, “Nobody can do everything, but everyone can do something.” The range of market- and incentive-based programs in the District are allowing an expanding number of partners to green their communities and protect the District’s creeks and rivers.